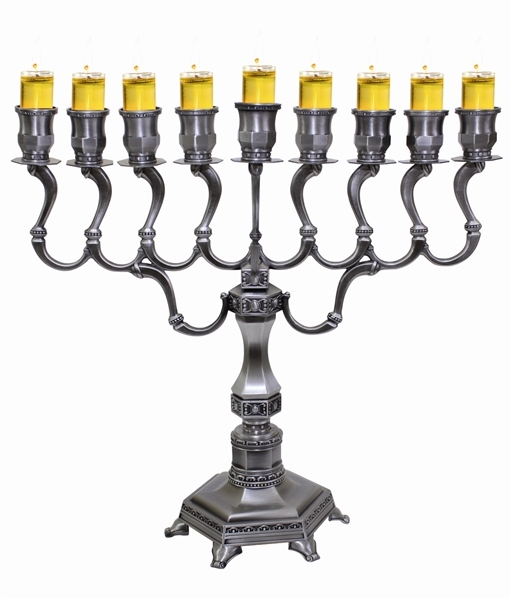 This pewter Maccabee Hanukkah menorah is where the old with modern touch-ups meet. Set in the traditional style, the menorah is designed with an impressive array of different modern twists. The menorah stands sturdy on a set of legs supporting its hexagon shaped base. The main body is designed with multiple matching hexagon shaped designs. The candleholders on this menorah are suitable to adapt glass oil cups (glasses not included). This nine branched menorah has the middle “shamash”, or helper, is distinctly placed off the center. The eight other branches, presenting the eight days of Hanukkah, are crafted, four from both sides, are in an aligned row.